Redemption rights are only available to the holders of interests' junior in priority to the lien foreclosed. A junior lien is a Deed of Trust or other lien/encumbrance subordinate to the Deed of Trust or other lien being foreclosed. To prevent misuse of the redemption process, the junior lien must be recorded prior to the Notice of Election and Demand. The junior lienor must file the intent to redeem within 8 business days after the sale. An intent to redeem cannot be filed before the sale. The notice of intent to redeem may be filed late if no lienor junior to their lien has redeemed; their redemption period has not expired; a redemption period has been created by the timely filing of a notice of intent to redeem; and, the intent is accompanied by written authorization from the attorney or the certificate of purchase holder authorizing the public trustee to accept late notice, or, if a redemption has occurred, from the immediately prior redeeming lienor or their attorney. CRS 38-38-302 (1)(d)(IV). The instrument evidencing the lien and any assignment of lien to the person seeking to redeem must be attached to the notice of intent to redeem. The instrument evidencing the lien must be the original or a certified copy, or in the case of a qualified holder a copy. The lienor must attach a signed and acknowledged statement of the lienor, or a signed statement of the lienor’s attorney, with the amount required to redeem the lienor’s lien. The amount includes per diem interest through the end of the lienor’s redemption period. The public trustee will, within one business day after receipt of the notice of intent to redeem, request a statement from the holder of the certificate of purchase or their attorney. The signed redemption statement must be submitted to the public trustee within 13 business days after the sale. The statement may be amended up until 2 business days before the start of the next applicable redemption period. The public trustee will transmit the statement to the party who filed the notice of intent to redeem no later than the start of their redemption period. Redemption dates are set 9 business days after the sale date. The most senior lienor may redeem 15 to 19 business days after the sale but no later than noon of the final day. Each subsequent lienor has an additional 5 business days and must redeem by noon of the final day. Redemption periods are not shortened if someone redeems early. There can be no partial redemptions. A lienor holding a lien on less than all of, or a partial interest, in the property sold at sale must redeem the entire property. The public trustee may accept less than a full redemption amount with written authorization from the certificate of purchase holder, the certificate of redemption holder, or their attorney. An agreement to accept less than the full sum required for redemption by the certificate of purchase holder does not affect the amount of the deficiency bid at sale. Any redemption constitutes a full redemption of all sums that the certificate of purchase holder is entitled. Upon receipt of redemption payment, a certificate of redemption will be recorded. Recording of the certificate of redemption will be no sooner than 15 business days following the sale nor later than 5 business days after receipt of redemption funds. The redemption certificate is assignable by endorsement or by separate assignment. Redemption rights under federal law are separate and distinct from redemption rights under the Colorado foreclosure statutes. 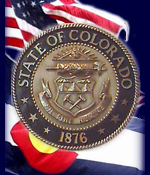 Any federal agency seeking to redeem under the Colorado statutes will be required to comply with all requirements of the Colorado statutes.